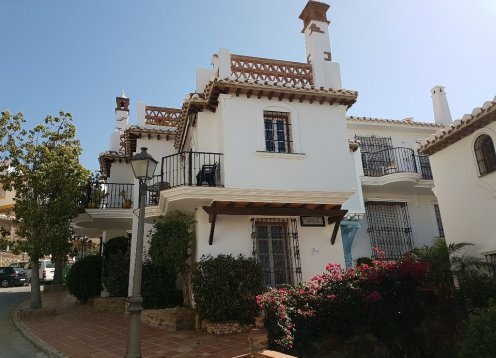 3 bedroom duplex house with air conditioning in Villamartin on the Costa Blanca. BBQ, wifi, private attached double parking. Plasma TV. Pets are welcome. Two nearby golf fields. Villa Alexandra 3 bedroom villa cortijo near Nerja and Torrox. Splendid 3 bedroom property near Nerja and Torrox only 500m from the beach. Luxury beachside two storey 3 Bedroom corner penthouse apartment in private complex huge swimming pool in Almerimar, Almeria. 150 mt. away from the beach. In private housing scheme with swimming pool, It has living-room, kitchen, 3 bedrooms, interior terrace and open large terrace. Magnificent 5 Bedroom Detached Villa on the Exclusive Cabo Roig Peninsula Costa Blanca South.